Like the old graphic chart recorders, display systems can record physical quantities of industrial processes or applications in laboratories over a long period of time. Some advantages of digital display systems are a high flexibility of use, more input channels, simplified record and a digital scale with both current and voltage signals. Display systems are usually designed in modules. Display systems offer different card sockets to introduce diverse card types to combine both inputs and outputs or digital interfaces. It is possible to design a specific display system for each customer. Display systems are operated by keys at the backside or by the touch screen. USB connectors or CF cards are used to store backup copies. Data can be directly transferred to a PC through digital interfaces. If you have any question about display systems, please contact us: UK customers +44(0) 23 809 870 30 / US customers (561) 320-9162 and our technical staff will be happy to help you with the display system as well as with the rest of measuring instruments and scales. Different quantities are usually used in complex installations. 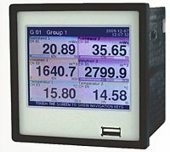 Display systems are required when it is necessary to record and store data. Display systems have several input channels. Since they are normally scaled normalized signals, display systems allow simultaneous record of different quantities. Graphic displays used in modern display systems can show graphically measured values during the measuring process. This allows to view the quantity development and to take actions if necessary. Mathematical connections can be performed in different channels. Displays systems are used when it is necessary to carry out a backup copy of measured values for further analysis, for instance long-term processes. It is necessary to document working conditions in different industrial processes (for instance in the food industry), so display systems are used for that purpose. If you wish to print a selection of display systems from our catalogue, click the PDF symbol. You are currently at: Home/Control Systems/Display systems.